We also offer two levels of on site interior design. Our home design consultants will advise on style and design and talk through the practicalities and feasibility of the customers design ideas as well as providing new and alternative ideas for consideration. 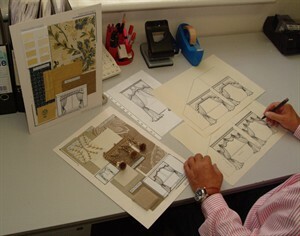 Our interior design team offer a more extensive service completely tailored to each individual client. Following an initial site visit our designers will prepare mood boards to illustrate the full concept of the scheme – furnishings / wallcoverings / paint / carpet – and a presentation will be made to the client. Unique hand drawn sketches can also be presented to provide a visual representation of the proposed design. Whatever the project, however large or small our designers and consultants can offer creative, imaginative and practical design solutions.